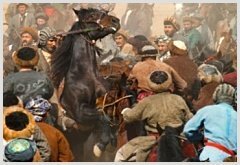 Buzkashi is the national game or sport of Afghanistan. Buzkashi is like baseball to the American, cricket to the British, and soccer to the French. This national game is believed to be played in Afghanistan since the days of Ghengiz Khan, the Mongol warrior whose army swept across Asia in the 13th century. The Dari (Persian) name Buzkashy means "goat-pulling" and is played on horseback by two opposing teams. The game is mostly played by Uzbek, Turkmen and Tajik ethnic groups of the region. In Buzkashy, a calf is normally used, beheaded and has its limbs cut off at the knees. Then it’s soaked in cold water for 24 hours before the play to toughen it. Occasionally sand is packed into the carcass to give it extra weight. Though a goat is used when no calf is available, a calf is less likely to disintegrate during the game. Players may not strap the calf to their bodies or saddles. The rules may vary a little from the north, the home of Buzkashy where there are few rules, to the south in and around Kabul. The game embodies the Afghan's love of horses and the oneness he develops with his trusted stead. It takes years of training to reach the necessary skills to play the game safely. The Afghan proverb "better be a bad rider on a good horse than a good rider on a bad horse" sums up that there is need for the horse to be well trained. When a good rider and horse are one, a player known as Chapandaz is born. There are two types of well-known horses in Afghanistan. One is the "Qataghan" type which is smaller in size but strong and sturdy and the other is raised in the steppes of Faryab and Balkh provinces which are larger in size. 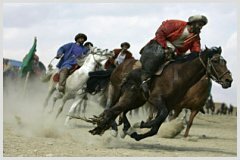 The Buzkashi horses are well trained and fast runners which each horse may worth of $10.000 to $15.000. Riders usually wear heavy clothing and helmet to protect themselves against other players' whips and boots. March 21st is called Nawruz, which is the first day of the Afghan New Year and the start of the Buzkashi season. The finely trained horses proudly trot towards the grandstand as each team of 15 players is introduced to the VIPs and spectators. The headless calf (sometimes a goat) is placed in the circle close to the stand. At the shout and whistle of the referee the Chapandaz (master players) try to grab the goat out of the circles while the rest of the team hover around. The experienced players try to rear the horses, which snort, bite and kick as melee develops. Riders slash the opposition horses and riders with their whip as the experienced Chapandaz try to grab the goat and pull it up to-wards the pommel and then tries to break clear of the melee. Once free, he is hotly pursued and rides furiously to the first corner turning post. The game is at its best as the horsemen with his calf heal steadily races across the face of the mountainous landscape pursued by op-position riders who try to wrest the calf from his grip. The object is to ride around the corners posts of the field and to drop the calf in the circle. When the Chapandaz breaks free, there is a magical moment of oneness, man, horse and landscape merges. The game usually lasts one and a half to two hours in a highly competitive contest. 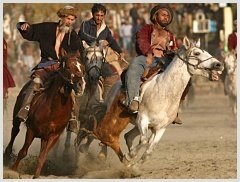 Buzkashi is usually held in several part of the country including the Olympic stadium in the capital city, Mazar-e Sharif, Faryab, Maimana, and some other parts of the country. Bushkashi game is considered as the toughest sporting game in the world and its a cross between polo, rugby, wrestling where whipping opposing horse riders until they bleed from the face is quite common. Instead of a ball you have a headless goat or calf, and the object is to wrestle, ride, fight until someone gets the carcass clear of the melee and the gallops to the goal (circle) in front of the grandstand and drops it in. The spectators who are males usually watching the game from their seats above the playing field. The wisdom of Buzkashi game passed on from generation to generation in Afghanistan. On the other hand, the Afghan national game of Buzkashi didn’t only remain in Afghanistan, but the game has found its way to the United States and some other Western countries.